Compton Avenue School burnt down in 1906. According to its 1907-1908 report, the Board of School Commissioners decided to rebuild, but in a more suitable location. Two building sites were purchased; one on Chebucto Road, which was to become Chebucto School and house Non-Catholic students, the other on Oxford Street for Catholic students – the birth of Oxford School. The school, as it is known today, has undergone many changes and expansions. The original, wooded two-story building was designed by W. J. Busch and build by W. T. Harris Construction. It contained four classrooms, a teachers’ room, and a library. It boasted a fireproof coal furnace in the basement. The cost of construction – $25,558.00. When Oxford School first opened in 1909, it housed students from Maryvale School (near the corner of Dutch Village Road and Mumford Road) and those from the Compton Avenue School. The principal of the new school was Sister Mary Pius and it was staffed by the Sisters of Charity. By 1913, the school was overcrowded. Each of the classrooms contained two grade levels and the total population was over 300. A new “Annex” was placed on the property and a permanent addition was built and ready for use by September of 1915. It contained six more classrooms and an assembly hall. It was built on the ground floor and had a separate entrance. Total cost of construction – $37,500.75. The population of Oxford School continued to grow and by 1920 a recommendation was made to the Superintendent of Education that another building be added to the Oxford Park lot. This building, the Oxford Bungalow, opened in 1923 and was a one-story brick structure that housed Grades Primary and One (2 classes of each). In 1939, another separate building was opened on the Oxford site in order to accommodate Junior High students. Called Oxford New, it was a three-story brick building containing twelve classrooms and offices. It was located on the property between the old wooden school and the bungalow and faced North Street. This building remains as the center section of the present Oxford School. One of the recommendations of the 1944 School Commissioners’ Report was to replace the old wooden building and the bungalow with a new structure, but this did not happen until almost twenty years later. A stormy battle was waged between the parents of Oxford students and the School Board with regards to the dangerous conditions in the “mausoleum” and the lack of heat in certain classes during the winter months. Finally, an addition to the west side of the Junior High building was constructed and opened in September 1959. A two-story addition, it held four classrooms upstairs and an Assembly Hall/Gym downstairs. In later years, the gym area was converted into four more classrooms. Today, this addition houses the Art Room, AV. Room and Resource Rooms on the bottom floor and the grade 5 and 6 classes on the top floor. One final addition to the Junior High building opened in 1967. This three-story brick structure was attached to the east wall of the Junior High building and a gymnasium extended from the west wall of the new addition out to Willow Street. A new feature in the design of this building was the inclusion of floor to ceiling windows in the classrooms. In 1998, the Gym, Library, Science Lab, Computer Lab, 17 classrooms, 2 Staff Rooms and the Administration Offices are found in this addition. By September of 1967, the original Oxford building and the Oxford Bungalow were demolished. Originally, all instructions at Oxford School were spoken in English. Now three Junior High classes are classified as part of the bilingual program of the Halifax Regional School Board. In 1978, the first Elementary French Immersion classes were set up in the Chebucto Bungalow and came under he Oxford School Administration. These Elementary classes were later moved to their own separate location and it wasn’t until 1992 that a Grade 7 Bilingual class was added to the Oxford population. Since then, a new grade 7 class has been added each year and the first Bilingual class graduated from Oxford in June of 1995. Students in the Bilingual Program arrive each September primarily from St. Catherine’s school and are integrated with the English students for English and Math classes at the Grade 7 level. In grades 8 and 9, the Immersion classes remain self-contained. With the closure of Bloomfield School in 1988, the boundaries of Oxford School were expanded to include students who would have attended Bloomfield. 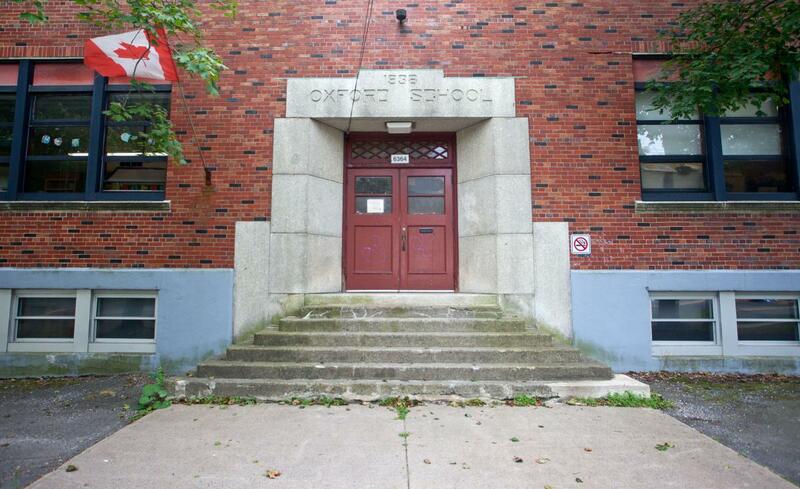 At the present time, students leaving Grade 6 at Joseph Howe School may choose to attend Oxford. Students living outside of these boundaries must make an application to the school if they wish to attend Oxford. Permission is granted only if staffing and class size at the intended grade level allow.